The saddest journey in the world is the one that follows a precise itinerary. Then you’re not a traveler; you’re a tourist. Tuesday December 6, through Thursday 8, 2016-Oak Grove RV Park, NAS Pensacola, Florida: A wild night of thunderstorms battered the Gulf Coast. 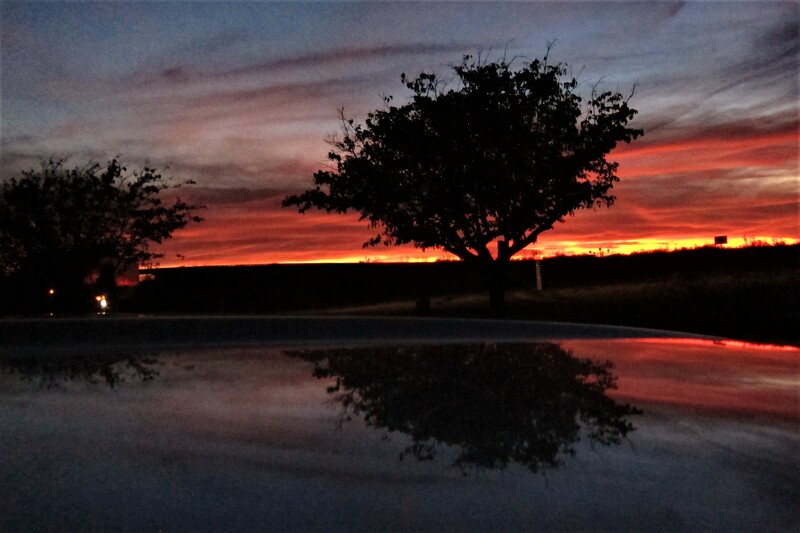 However, Kit and I woke to a stunning sunrise…well, I did, Kit will see the sunrise in photo form. 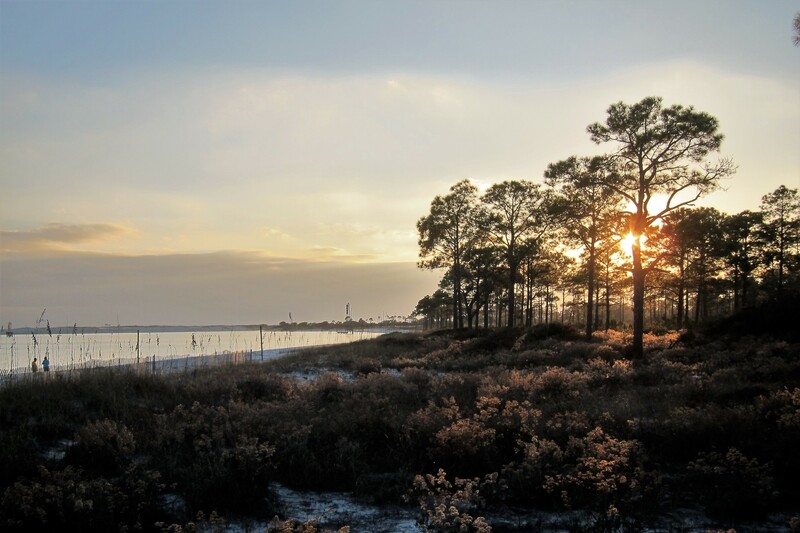 The glorious morning glow filtered through the trees bordering our campsite on Pensacola Bay. Apparently, the storm abated sometime after midnight and today looks to be a bright and warm day on the Florida coast! Spent the morning finishing the setup of the rig by connecting water and sewer lines, disconnecting the truck and levelling the camper. 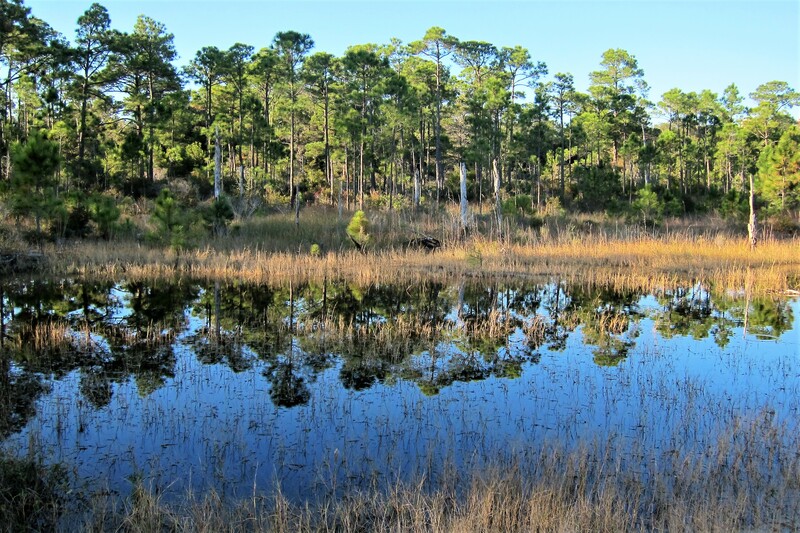 We have a very nice site with a path behind that leads through a stand of Coastal Pine and Live Oak trees to the beach. And, the sparsely populated beach on this late fall morning is calm and serene. Since Kit needed some quiet time to work on her Christmas card project, I took a stroll down the beach to scout out a suitable kite flying location. Unfortunately, the area that I’ve used in the past has changed to the point where attempting to fly would have been risky to the somewhat delicate and pricey kites. However, I did come across a nice little hidden lagoon that had likely been created by the torrential rains of days’ past. In addition, there were several pieces of driftwood that had found their way to shore during the storm. And, a few of these little fellows flitting about my feet as I walked along. Then, I came to one sight that reminded me of home. 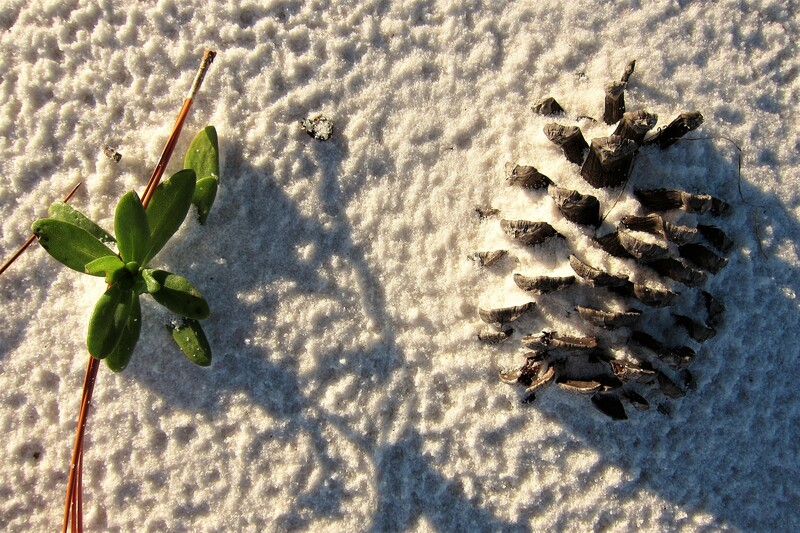 Yep, the lowly pinecone partially buried in what looked to be snow…an image I often viewed in the dooryard of my Maine home. However, today on the Gulf Coast of Florida, the temperatures are in the low 70’s! Naval Air Station, Pensacola has been our host on many Excellent Adventure trips. 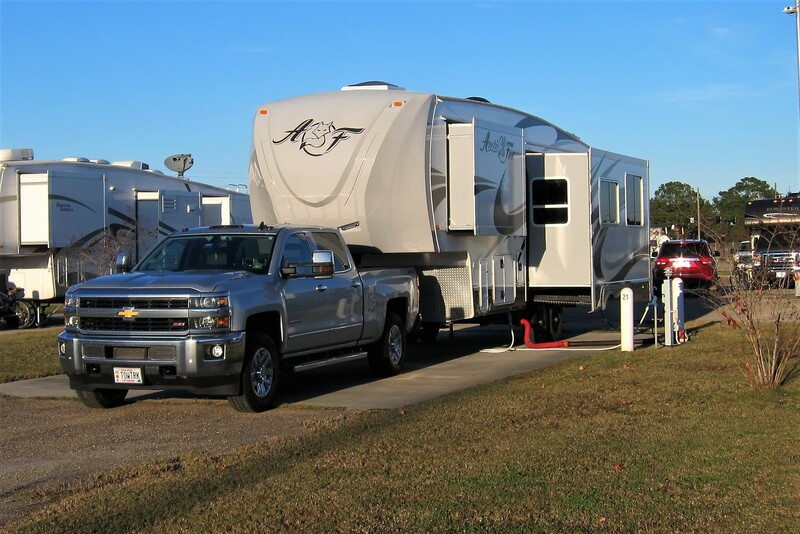 Since we need to head south to escape winters grip, the Florida panhandle is a convenient and comfortable place to rest a bit and prepare for our trek toward the west. 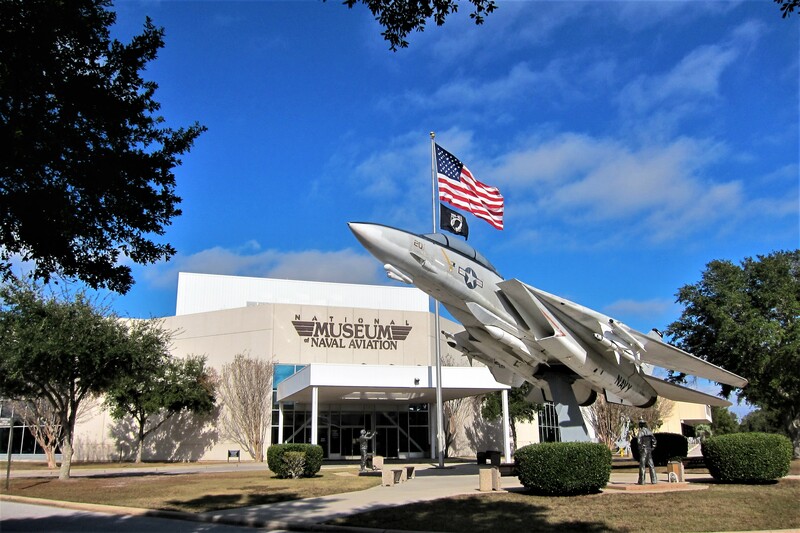 The base is known as The Cradle of Naval Aviation and as such is the initial primary training facility for all Navy, Marine, and Coast Guard pilots. Established in 1914, the first flight was made from a crude runway later that year. In the early years, about 100 cadets per year were trained in aviation, then, following the breakout of WWII that number exploded to 1,000 a month! During our stay, numerous training aircraft flew over the campground…some so low that the pilots helmet could be clearly discerned. 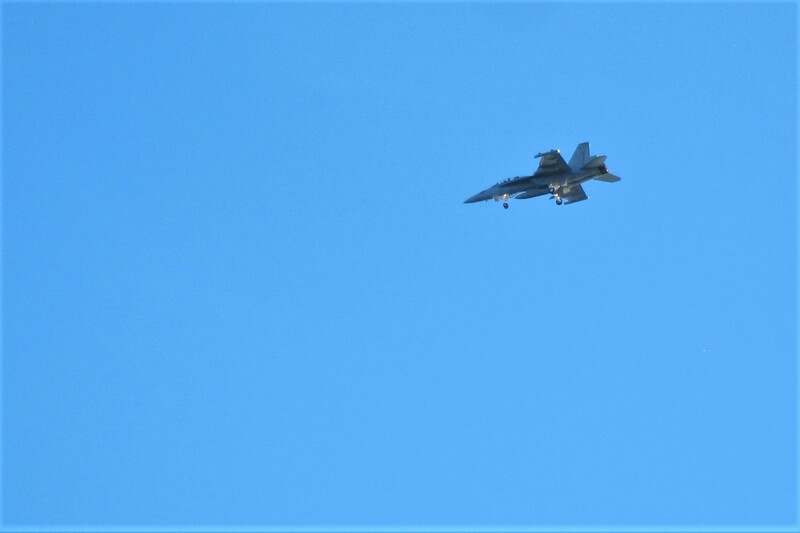 In the morning, a number of them would take off, fly offshore and loop back to the airfield only to land a few minutes after they left!?!? I’m guessing they forgot something, but I’m willing to bet it was not a bicycle! 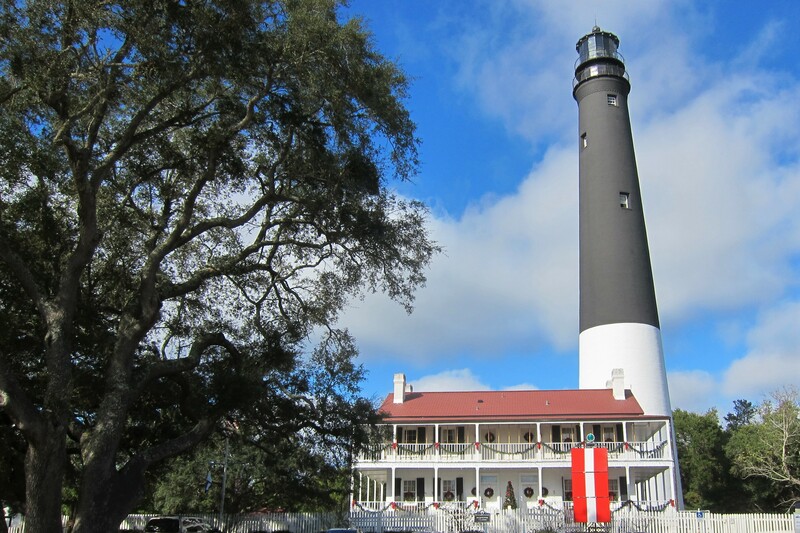 A short walk from the campground lies Pensacola Lighthouse. A historic structure we have enjoyed and written about in past Excellent Adventure Journals. And, another 15-minute stroll from the lighthouse, one comes to The National Museum of Naval Aviation. This too has been discussed heavily in past journals as Kit and I have toured the magnificent facility close to a dozen times. 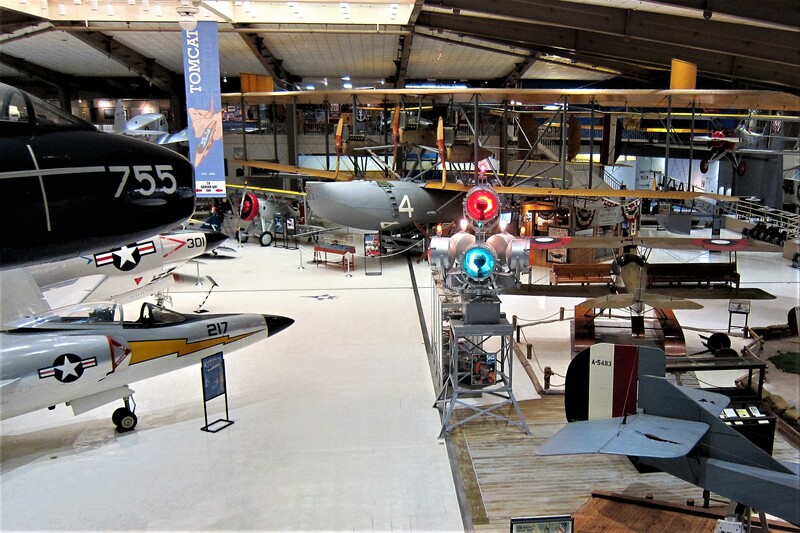 The museum features aircraft from the earliest days of aviation to the vehicles used in the space program. 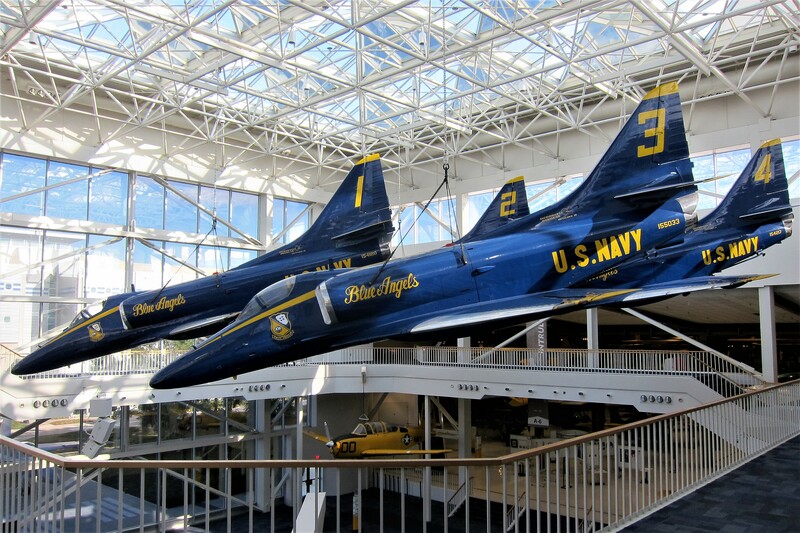 Being as NAS Pensacola is the home of the Navy’s flight demonstration squadron, The Blue Angels, many of their historic aircraft are featured in the museum such as the Delta Formation hanging majestically from the glass ceilinged atrium. There are a few new displays, one of which documents the Navy warships that protected the aircraft carriers and provided shore bombardment during the Vietnam War. 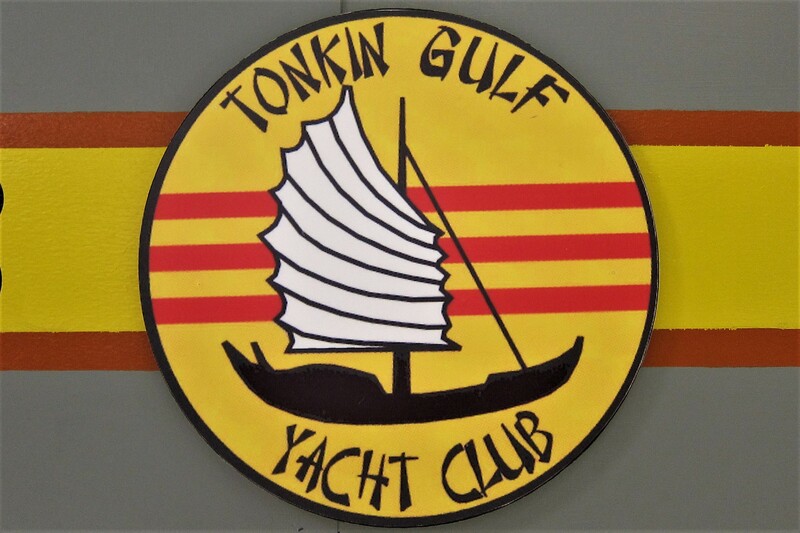 This gaggle of old WWII era Gun Destroyers, two of which I was deployed on, was known as The Tonkin Gulf Yacht Club. Small, fast, agile and dispensable, these rust buckets spent many hours only a few hundred yards offshore lobbing 55 pound projectiles at targets inland. The ships were also outfitted with .50 caliber machine guns to engage the various VC sampans that bobbed about the gulf. Another new display is one that we heard about from a neighbor out at our family camp in Maine. 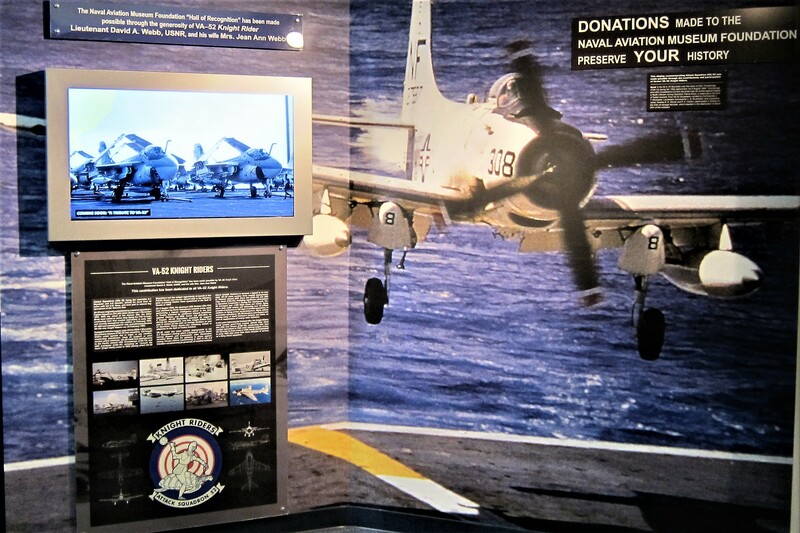 Jon and Jan were tasked to represent a departed family member who had left an endowment to finance the remodeling of a portion of the museum and establish an interactive display for Navy Squadron VA-52…The Knight Riders. Jon’s uncle, LT. David Webb, flew for The Knight Riders during the Vietnam conflict and desired that the museum honor the men and women he served with. 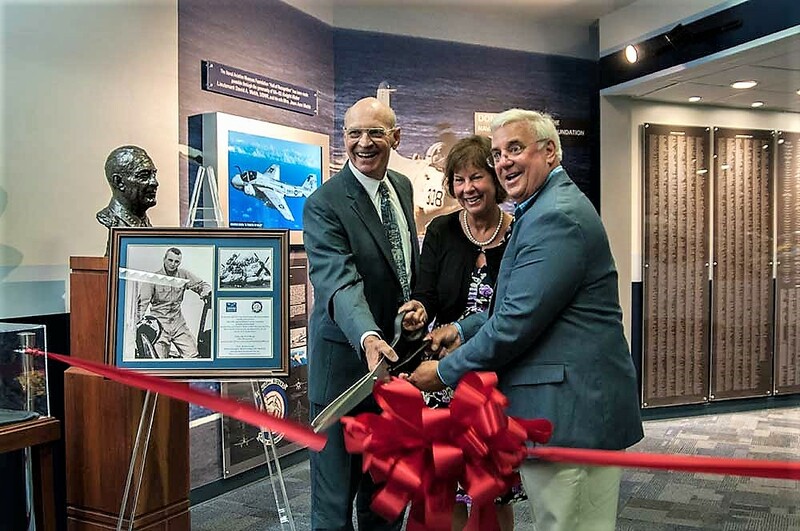 At the ribbon cutting, Jon and Jan were hosted by the museums president, Lieutenant General Thiessen, a former Marine pilot. Great job, Jon and Jan…thanks to your family for helping support this venerable and historic institution. Since Kit needed some more Kit Time, I took my bike and rode about the base. 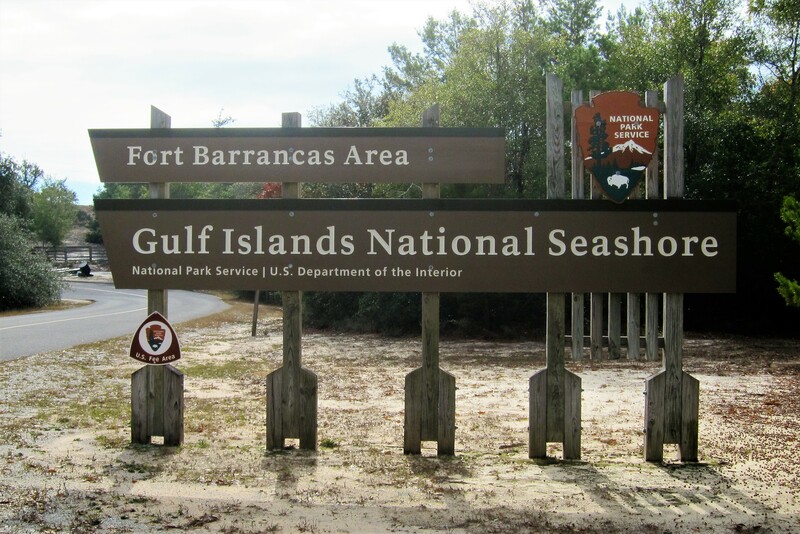 A short spin down the road from the campground is the NPS Visitors Center for Gulf Islands National Seashore and the historic Army outpost, Fort Barrancas. 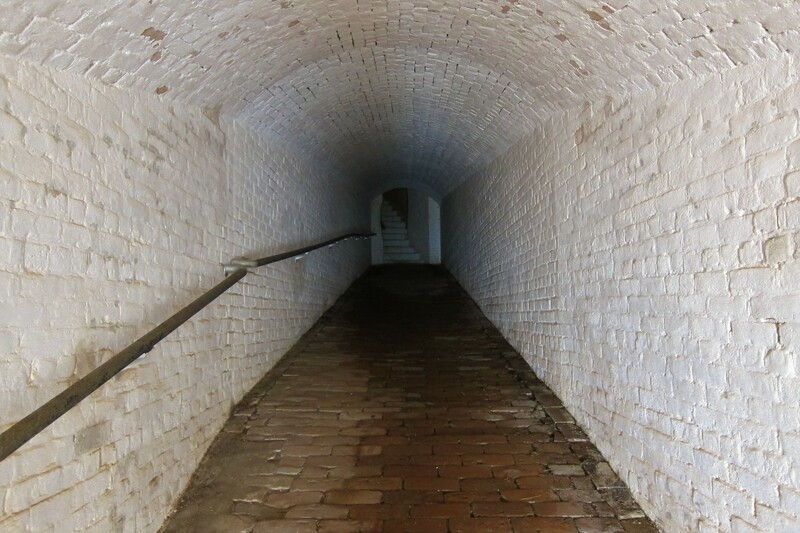 The original fortress, called Fort San Carlos, was constructed in 1787 by the Spanish on a high bluff overlooking Pensacola Bay. Known as a “water battery”, the three gun ports were arrayed along the front of the masonry fort at a relatively low elevation. This configuration allowed the guns to fire at a low angle which caused the shot to ricochet across the bay and hit marauding warships…similar effect to skipping a flat stone across a placid pond. 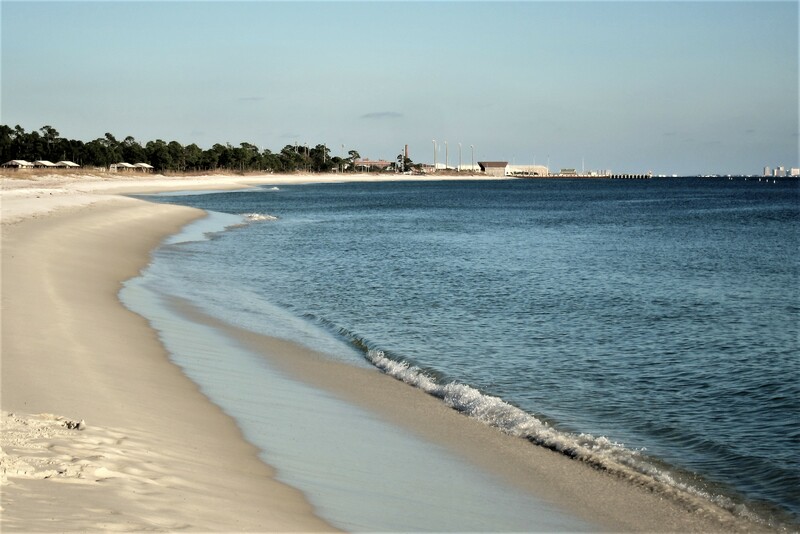 In the early 1800’s after Florida became part of the United States, Pensacola Bay was selected as the site for the Washington Navy Yard and a larger fort was constructed behind and above the original. 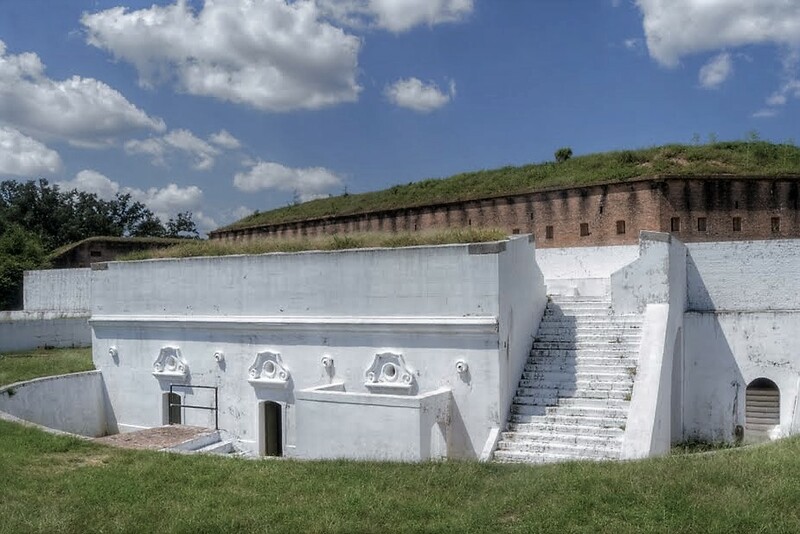 This structure, sited on a high promontory was built of more durable brick and named Fort Barrancas, the Spanish word for “bluff”. They then connected the two forts by a tunnel. 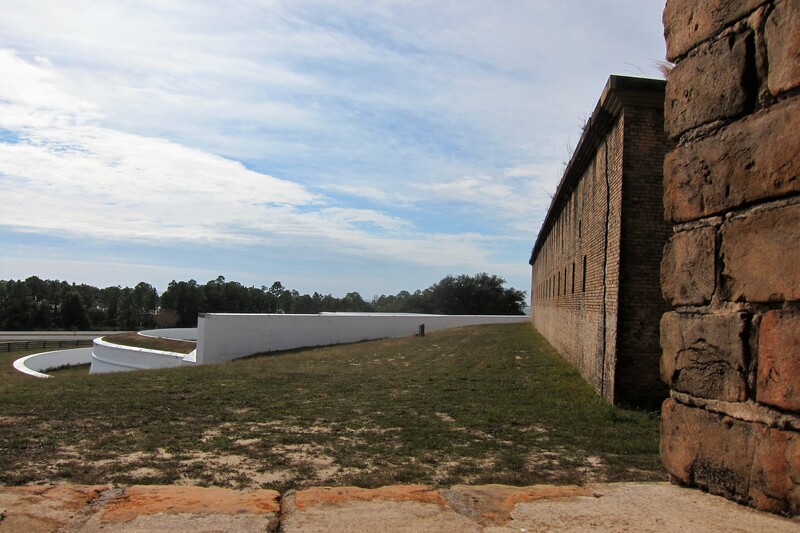 The newer portion of the fort was heavily armed with huge cannons designed to expel “hot shot” against invading ships trying to enter the Pensacola Bay. Hot shots were cannon balls heated red hot in a nearby furnace which would wreak havoc on wooden vessels of the day. There were forty cannons of various displacements arrayed around the perimeter of the fort and another fifteen mounted in the water battery including the three low angle cannons mentioned previously. 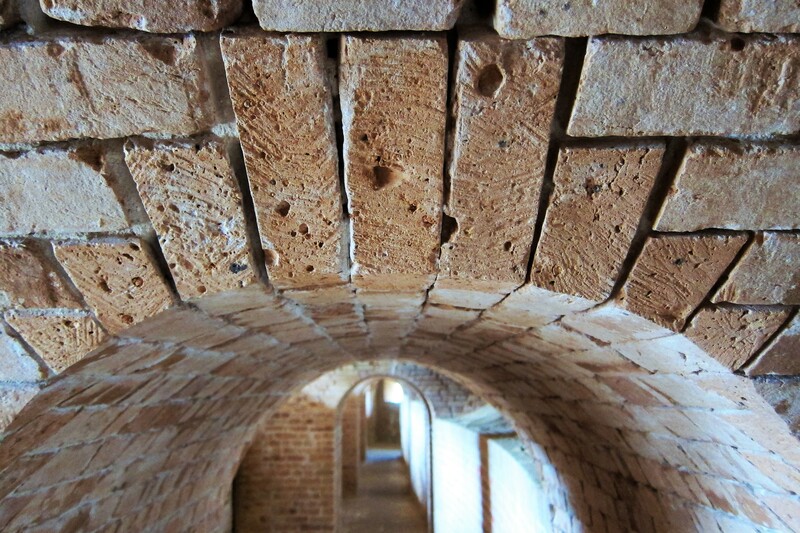 Fort Barrancas was completed in 1844 by sixty African American slave laborers. The slaves cut and laid over six million bricks, all by hand. Where necessary, the bricks were filed by hand and many surfaces show the marks of the slave’s work. Considering their harsh servitude, the slave craftsman did remarkable work. 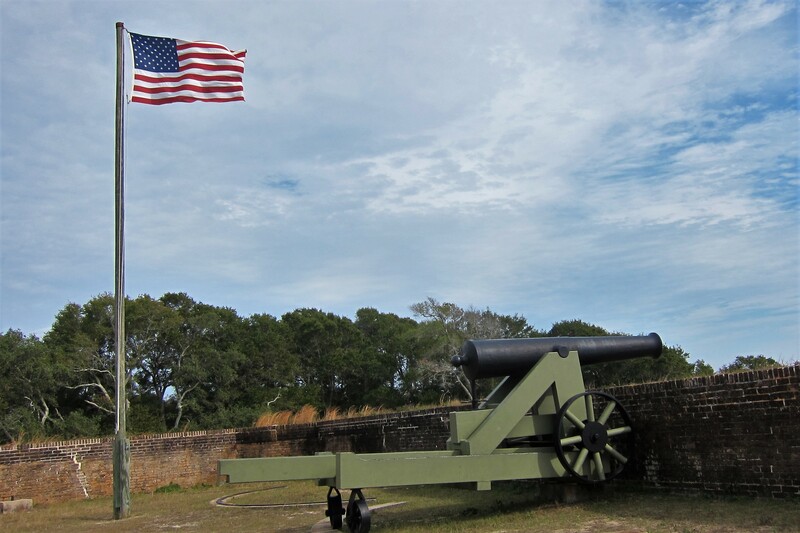 Ironically, the imposing fortress complex, built to protect Pensacola Bay and the Navy Yard from invading foreign forces, was only attacked once…By the US Army during the Civil War trying to expel the occupying Confederate Army. 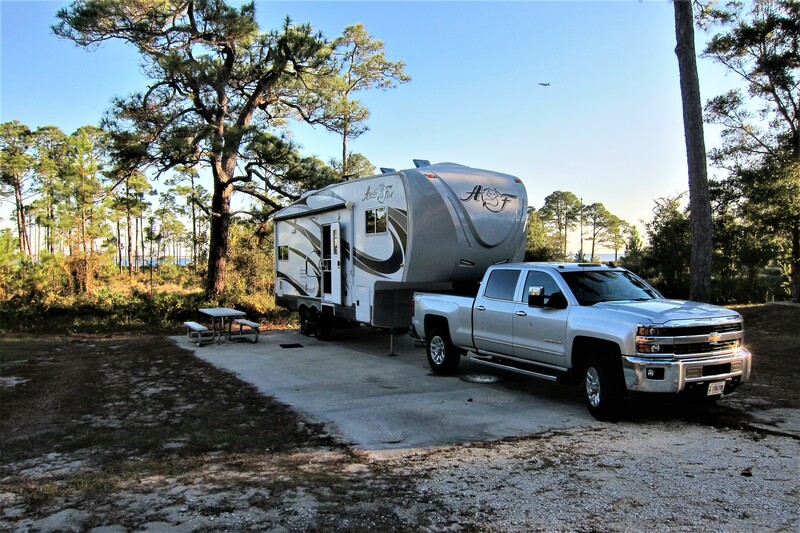 The Pensacola area is ripe with American history and bears a considerable time investment to fully explore and appreciate…Kit and I have camped in the area many times over the past nine years and still have not seen it all. Speaking of Kit, she is a marvelous cook and traveling in an RV affords her the opportunity to prepare many home cooked meals, for which I am grateful. 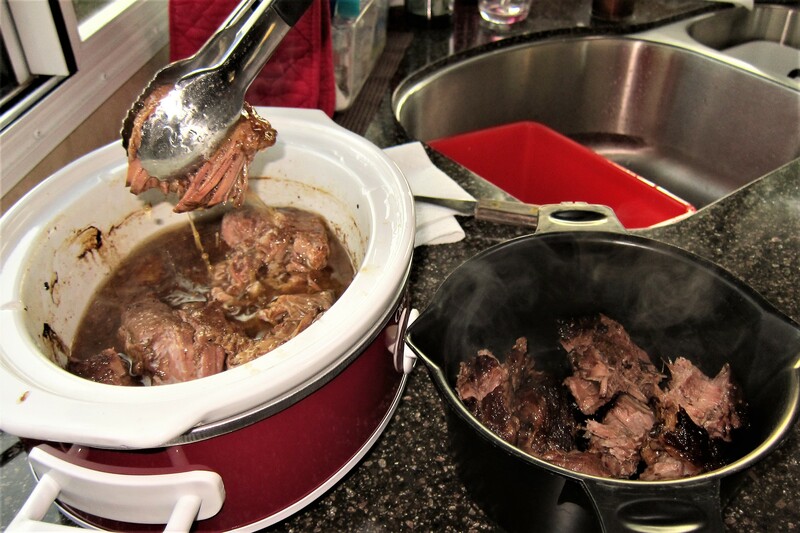 One of her techniques is to fill a Crock Pot with Beef, Pork or Chicken and slowly simmer the meat overnight. Waking to the aromas is like heaven and the prospect for many great meals is well worth the effort. Well, our stay in Pensacola has come to a close. As in the past, Kit and I have thoroughly enjoyed relaxing on the beach while preparing for the next leg of our journey. 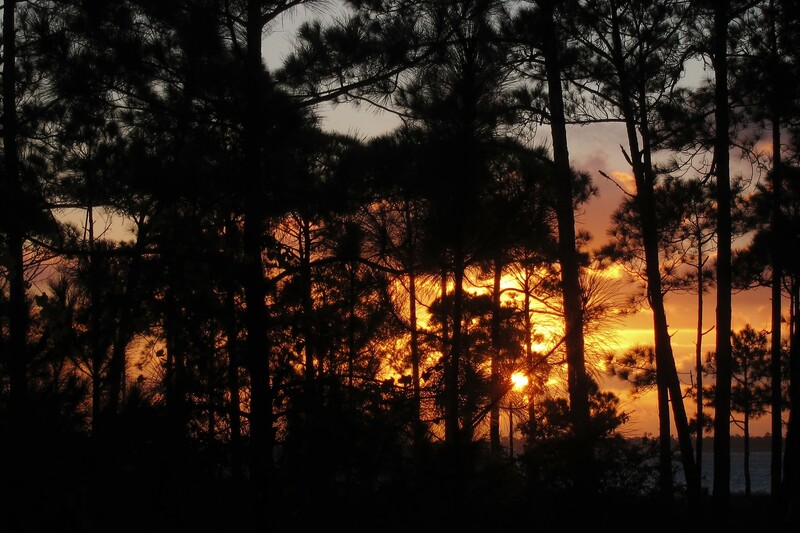 As the setting sun filters the last rays of light through the majestic trees, we bid you a goodnight. Friday, December 9, 2016: Woke to sunny but cool weather and following breakfast we prepared to depart Pensacola, Florida. Part of my routine on a travel day is to check the rig carefully for any potential problems. A few days ago, I noticed unusual wear on one of the trailer tires and have been monitoring it since. Well, this morning it appeared worse and felt soft even with the required 80 psi pressure! Looks like a new tire is in store (no pun intended) for us. 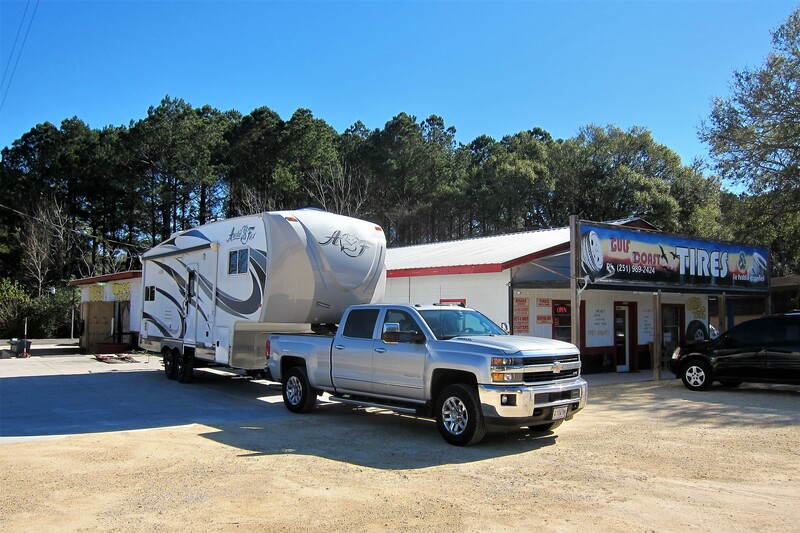 RV’s use a special tire that can handle the load and stress of its specialized use…as the rig turns a corner it exposes the tire sidewall to high levels of stress. So, the first order of business is to procure a proper RV tire. Underway at 0950 and heading west toward an RV store Kit located online. In a few minutes, we were crossing Perdido Bay and entering the state of Alabama. Then pulled into a Camping World store that advertised RV tires only to find out they do special order only. However, they referred us to a “shade tree” tire shop a short distance away. Arriving at Gulf Coast Tires, we were pleased to find plenty of room to maneuver the rig into their work area. Run by a Hispanic family, they were very accommodating and efficient in servicing the camper. I asked for the spare, which is virtually new, to be mounted on the ailing tires rim and thought I may be able to use the bad tire as the spare…however upon taking the weight off the tire it was evident that the tire was shot. A good tire should be relatively flat across the tread. The bulging in the middle is a clear sign that the tread had separated from the carcass and the tire was ready to detonate, likely at an inopportune moment! 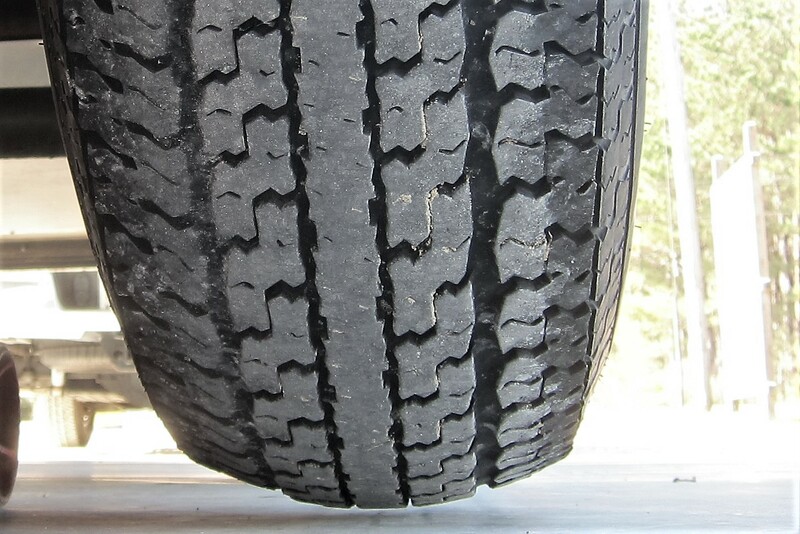 The strange wear pattern along the edge is also likely due to the tread separation exacerbated by the lack of tire balancing from the factory. This tire is one of the few remaining originals and with 26,000 miles of arduous use has held up pretty well, by trailer tire standards. So, a new (cheap/foreign) tire was purchased to serve as a spare and within a half hour the job was finished, complete with new valve stems and balancing…they even checked tire pressures and set lug nut torque on the remaining tires…all for a nominal fee! 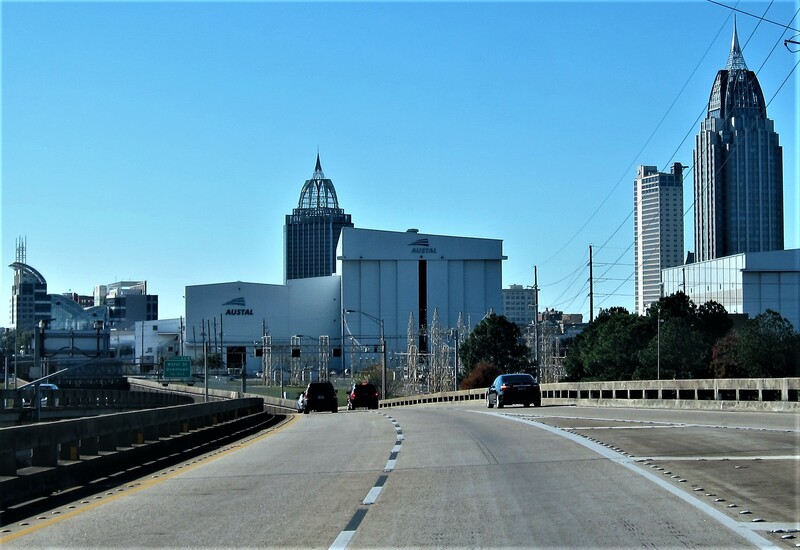 By 1200 Kit and I were back underway and ninety minutes later merging onto I-10 heading west…a few minutes later found us crossing Mobile Bay as the Austal shipyard came into view. This Australian owned yard has partnered with General Dynamics, the parent company of Maine’s Bath Iron Works, to build some of the Navy’s new LCS warships. At 1414 we crossed into Mississippi and started looking for a place to camp. Last year Kit and I made a stop at Kessler Air Force Base to visit the son of friends who was in training as a member of the Maine Air National Guard. Ken is back home, so this year we decided to stay overnight at the Navy Seabee Base in Gulfport for the evening. You may think I am obsessed with photographing our rig in its natural habitat…in reality, these journals are also a log book and I use the photos of where we stay to help document the campsite for future reference. Kit liked how clean and well run the park was and mentioned that with a cemetery across the road the neighbors were very respectful! After a nice meal and a relaxing glass of wine, it was time to hit the sack…goodnight. Saturday, December 10, 2016: Up to sunny skies and temperatures in the mid-fifties. Today is a short travel day so we lounged around the campsite a bit and accomplished some housekeeping chores. 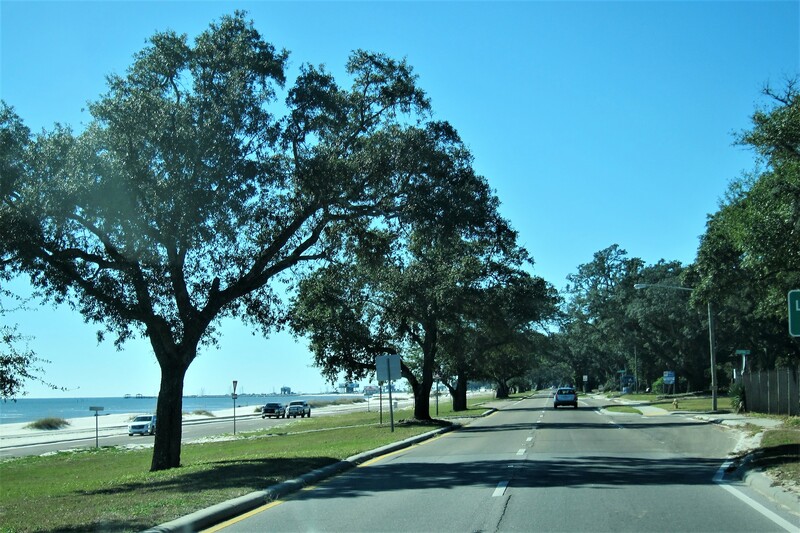 Finally, on the road at 1220 hours and headed west on US Highway 90 through the coastal communities of the Mississippi Gulf. On past adventures, Kit and I have taken this route all the way into west Texas. It takes a lot longer, but it is infinitely more scenic and enjoyable than hurtling down the ribbon of asphalt known at I-10. 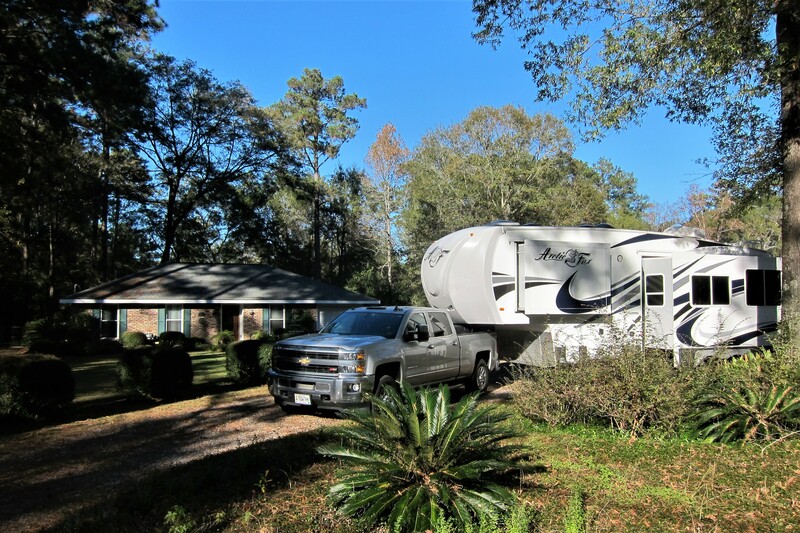 By 1320 we were crossing the border of Louisiana and connected to the I-12 for the trip around Lake Pontchartrain to the town of Covington, the home of some old Navy friends, Johnny and Eileen. These fine folks were our neighbors in Key West during the 14 months I was attending school there. We have featured them many times in past journals and it is always a pleasure to spend time visiting and reminiscing about the old days. As a special treat one of their granddaughters stopped by to see us. 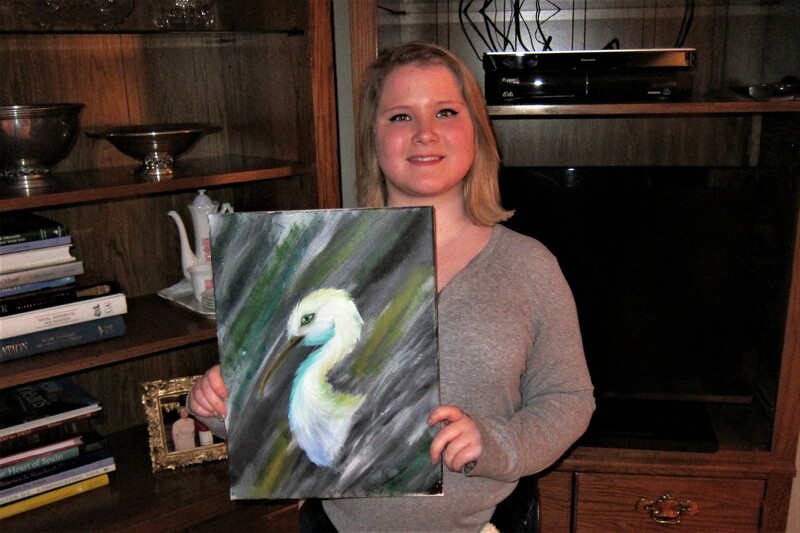 Shelby is a high school Junior and a very accomplished artist, as you can see by her original oil painting above. Johnny and Eileen invited us to stay a few days and we gladly took them up on their kind offer. After an excellent home-cooked meal of authentic Cajun Jambalaya and creamy coleslaw, we retreated into the living room to visit for the remainder of the evening. Sunday, December 11, 2016-Covington, Louisiana: Lazy Sunday morning in Southern Louisiana. The weather is beautiful…sunny and warm! While Johnny and I spend time in his very nice workshop, Eileen spent several hours showing Kit the power of Ancestry.com. Traditionally when we take advantage of the hospitality of friends to engage in some “dooryard surfing”, we reciprocate by taking the owners of said dooryard out for a nice meal. 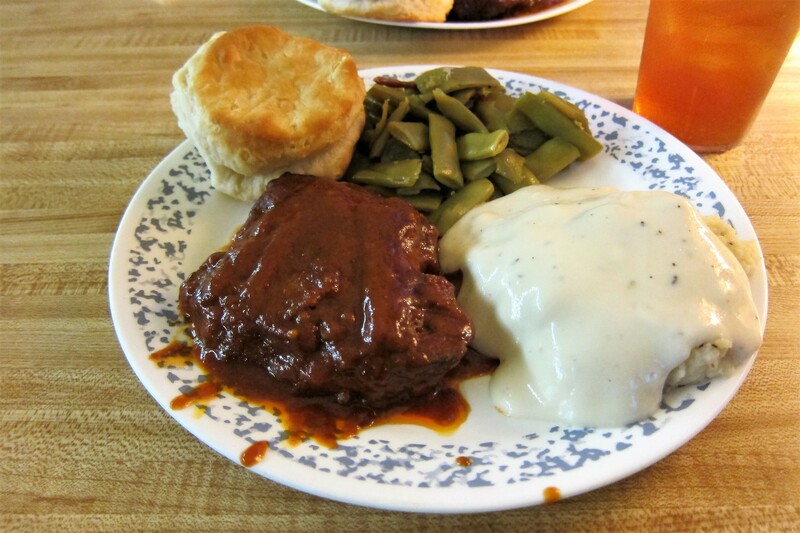 It’s a real win-win situation as we enjoy a free campsite and we all enjoy a great meal at a local establishment…this year’s visit resulted in a trip to the famous Copelands Restaurant. 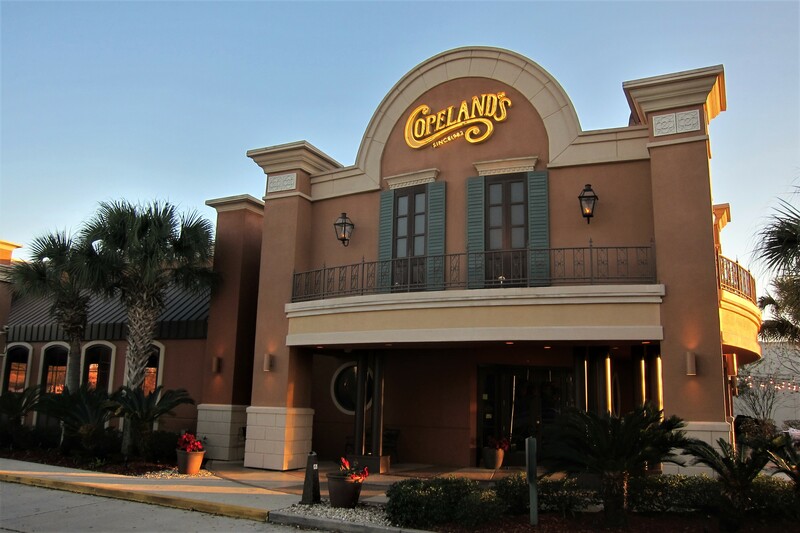 Copelands is well known for seafood done the Cajun way but they have many other signature dishes as well. Kit enjoyed the Pecan Encrusted Catfish and I the Shrimp Alfredo with Crab Cakes…both were excellent, as was the company we shared it with. However, toward the end, there was a little slight-of-hand on Eileen’s part as she covertly grabbed the bill and paid for the meal before I could react. Pretty sneaky…but thanks! The rest of the evening was spent at their beautiful home where we continued to talk about our shared history over a fantastic homemade Cherry Pie! Tomorrow we resume our push toward the west…thanks for a great visits folks, please come see us in Maine again real soon! Monday, December 12, 2016: Kit and I were on the road very early, for us. After a quick stop at the neighborhood Café du Monde for beignets and chicory coffee we rolled down I-12 at 0630 hours. 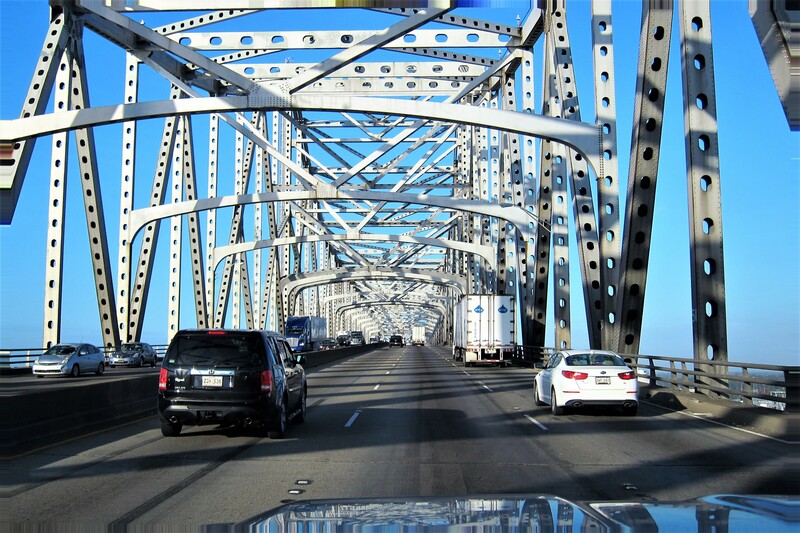 Soon we rejoined I-10 continuing west before encountering the town of Baton Rouge, home of the Palo Rojo, and crossed the Mississippi River on the Horace Wilkinson Bridge. By 0900, Kit noticed we were crossing the Atchafalaya Swamp, the largest wetlands in the United States, and suggested a stop at the visitor’s center parking lot for a camper prepared breakfast of scrambled eggs and fresh beignets. The temperatures have risen to the mid 70’s so I took the opportunity to don shorts for the first time in two months. 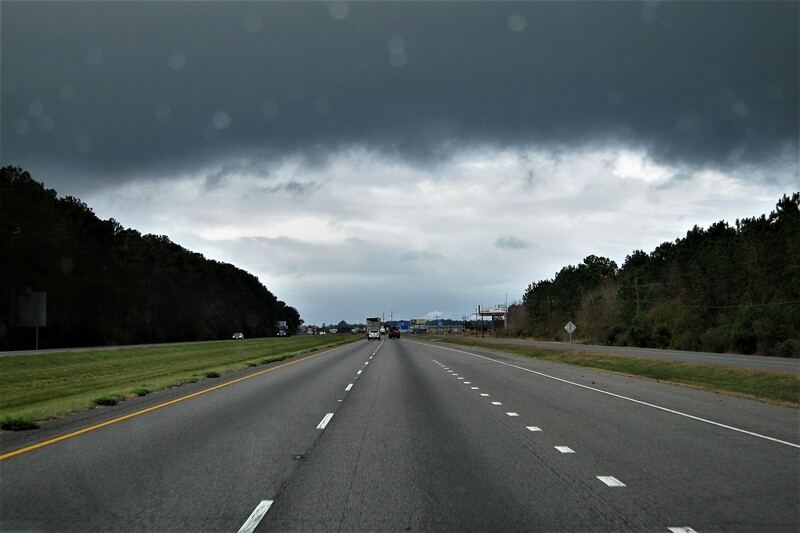 Back on the road at 0933, the skies ahead looked threatening and rain began to fall. But we soon punched through the storm front as we crossed into Texas and at 1300 hours, arrived on the outskirts of Houston. I despise hauling a truck and camper through a large city, but sometimes it’s necessary. 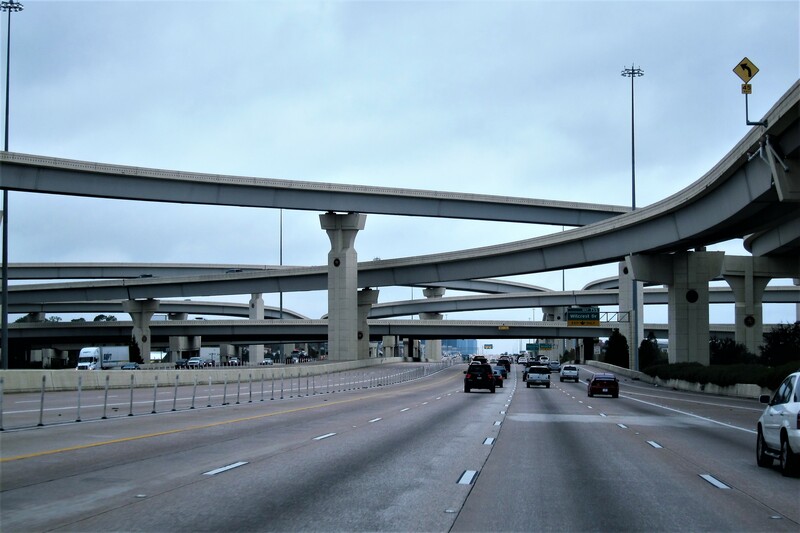 The advent of the multi-layer overpasses does help traffic move better but nothing can fix the rude and aggressive behavior of the average big city driver! On a more pleasant note, there are some friends from Maine that winter over near Austin, Texas and contacting them we were pleased that they could spare some time for a visit. We agreed to meet Rey and Darlene at the San Antonio Cracker Barrel early tomorrow morning. As it neared 1530 hours, our unofficial time to begin looking for a place to camp for the evening, Kit mentioned that we were only a few hours from the San Antonio Cracker Barrel. She called the store about their overnighting policy and was told to come on in, they would be glad to accommodate us! So onward we drove, arriving at 1715 and backed into a remote corner of their large and level parking lot. Whenever we take advantage of the kindness of a manager to camp on their store property, we make it a point to patronize the business. So, after setting up we visited the restaurant for a great meal followed by some reading time in the camper and an early turn in. Tuesday, December 13, 2016: Woke to a report from our daughter Kim that it’s snowing back home. It is cloudy here but the temperature is a balmy 64 degrees! Kit and I had a very restful night. Dry camping in a commercial parking lot is frequently plagued with light and noise…but this spot was ideal and suffered none of that! Rey and Darlene arrived a few minutes early…it was great seeing them, especially since Rey was preparing to undergo cataract surgery in the morning and the eye drops he was using made him a bit uncomfortable. We all had a very nice breakfast and great conversation while lingering over coffee, but all too soon it was time to go…they had things to do and we had to hit the road. My only regret was that I failed to snap a photo of our parking lot campsite. Fortunately, Rey took a photo with his phone that shows the camper in its overnight spot and two well fed road warriors in the foreground. Thanks Rey, for sending it along! At 1030 we pulled out and jumped on I-410 to circle around downtown San Antonio. 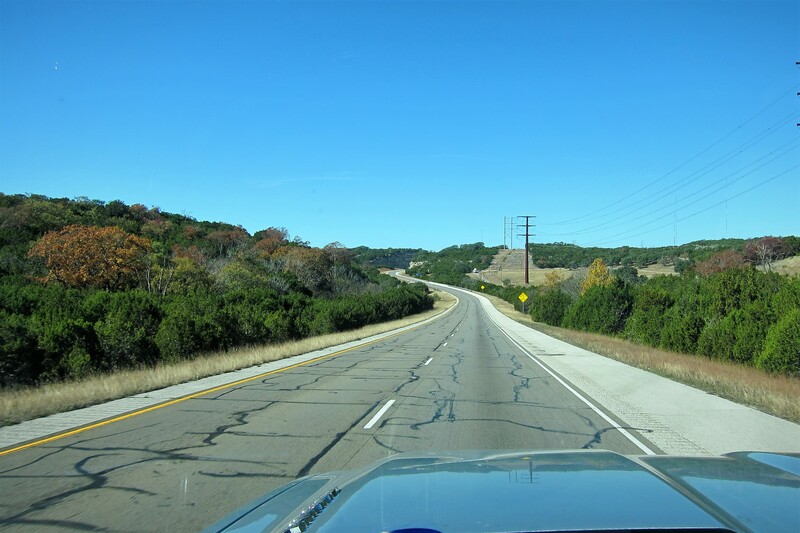 Within a few minutes, we were rolling through Texas Hill Country heading west. 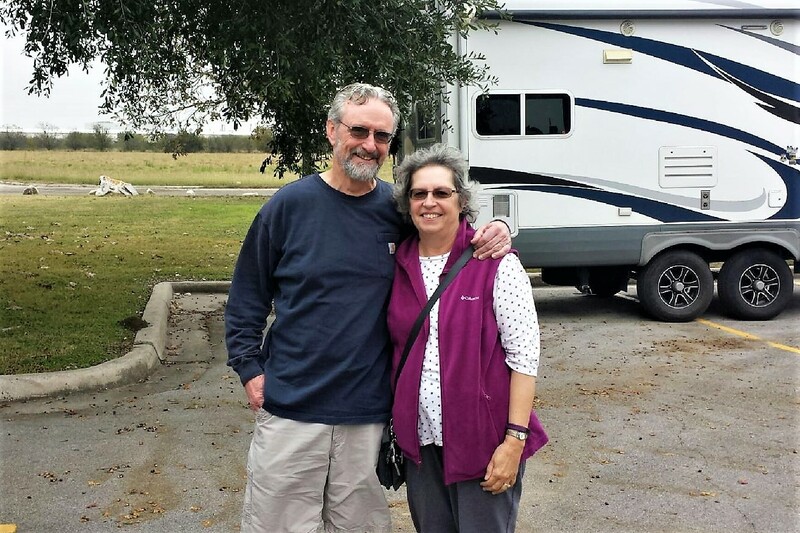 Today was an easy and uneventful drive but after a long day yesterday, and a late start this morning, we decided to stop early at an RV Park in Fort Stockton, Texas recommended by Rey and Darlene. This park is a nice, clean and well run facility…as an additional bonus they have their own café on the premises. 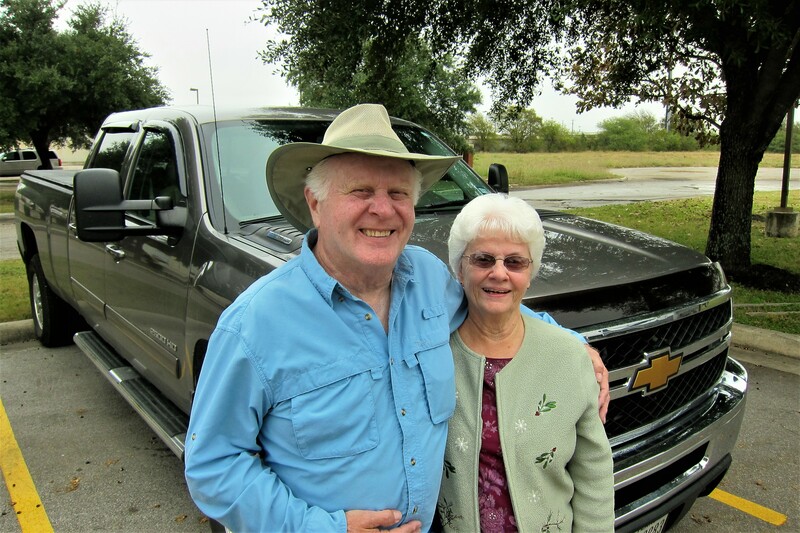 Shortly after setting up the camper for the night, Kit and I visited the dining room where we enjoyed their signature Texas Style Barbeque with all the fixings! After which a walk about the park was in order as the sun set on another great day on the road! Tomorrow we continue toward the west…stay tuned! Kit’s Bit’s: Well, other than the tire issue, this part of the trip has been very enjoyable. Always so good to spend time with Johnny & Eileen! She’s quite the expert at Ancestory.com so gave me a good start on how to navigate the system. This is something I’ve been thinking of doing for quite a while, just haven’t had the time. I’m looking forward to getting started with it after the holidays. We also enjoyed our short visit with Rey & Darlene. Fortunately, we see them during the summer too, as one of their daughters lives in Topsham and the other in San Marcos, TX. SURE ENJOY THE WARM UP TEMPS, EARLY TODAY IT WAS ABOUT 5 ABOVE. NO MATTER, CODY JR. CAME TO GET HIS 18 LUND FOR A WATERFOWL SCOUTING VOYAGE TODAY. WE WILL BE GOING DOWN TO MERE POINT SATURDAY CHASING GOLDEN EYE DUCKS AS WELL AS BLACK DUCKS. VERY INTERESTING ABOUT THE RED HOT SKIPPING CANNON BALLS, NEVER HEARD ABOUT THIS UNIQUE WEAPON. I SPENT HOURS SKIPPING FLAT STONES IN MY CHILDHOOD DAYS HERE IN MAINE. DRIVE SAFE AND MERRY CHRISTMAS IF THE CARD DOES’T REACH YOU IN TIME. I so enjoy all the hard work you put into your blog. We are doing well. I have wanderlust that has to sel calm for a while. Please have the merriest of holidays and safe traveling. How long to we have to wait for the RushPeabody travel blog to “come of age”? You two have accomplished so much on this leg of your trip. I loved the National Museum of Naval History and Ft. Barrancas. 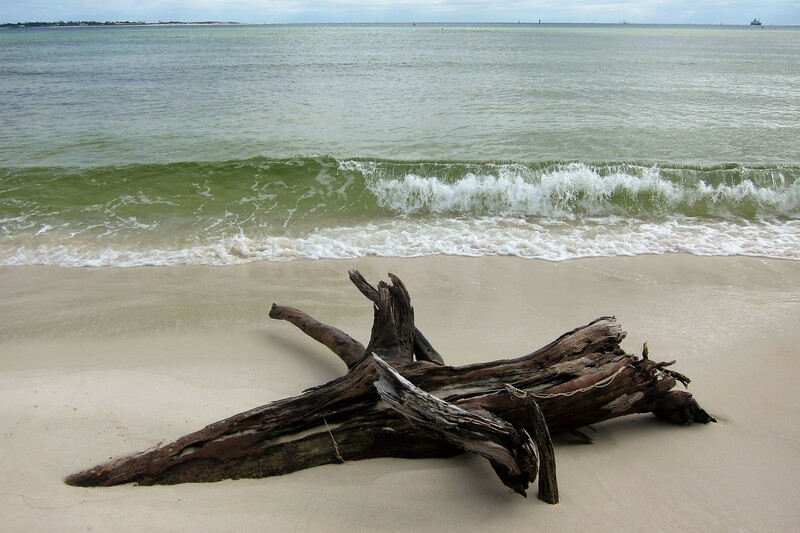 Pensacola area sounds like an incredible place to spend an entire week! Having the personal connections to a couple of the displays at the museum must have been thrilling for you too. Kit, good call using the Crock Pot! The contents look delicious!… I’m glad your tire issue didn’t become more serious! 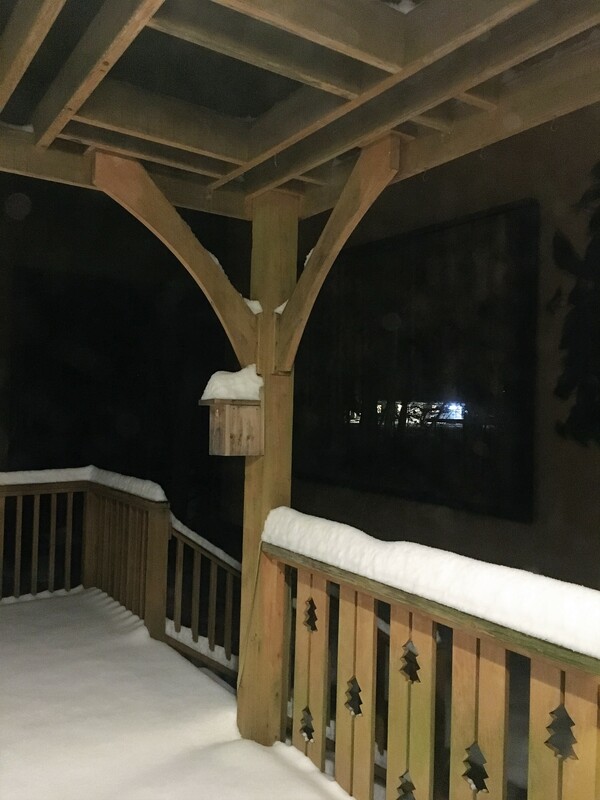 That would have put a damper on the trip a bit….. I’m enjoying your warm southern route on this trip…partly because it’s the opposite here in Maine!!!….. Great time in Florida and Texas. You do need to get a good Stetson and maybe cowgirl and cowboy boots. Nice rig Bill, wish I had come over and taken a gander before you departed. Allen Greene retires on the fourth, probably the longest surviving (working of course) member of the test team. Some bitterly cold temperatures back in Maine. Already looking forward to summer but picked up a snowmobile for some winter fun. Take care and say howdy to my girl Kit! I wanted to ask, what are you using for a camera, great pictures as usual. And……..merry Christmas to you both, God bless….. 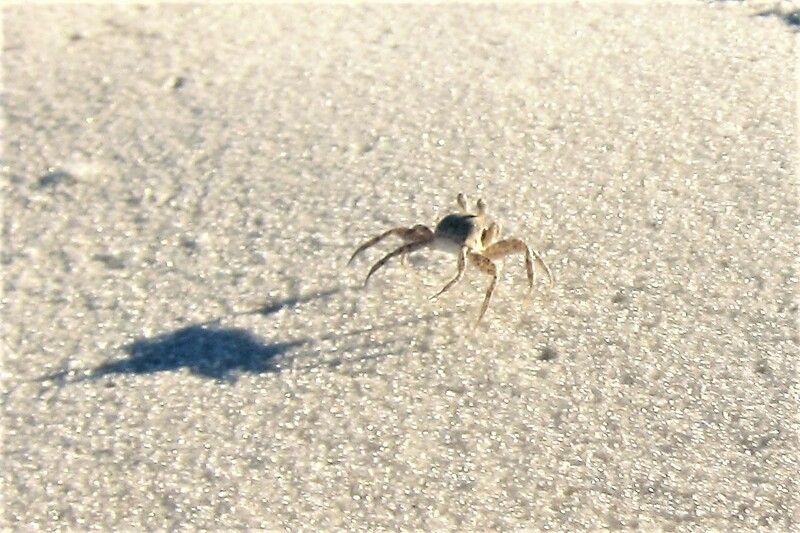 I really enjoyed this Blog episode—–makes me wish to be in Pensacola area with the white sands and placid blue ocean. The early history of the fort was interestin. 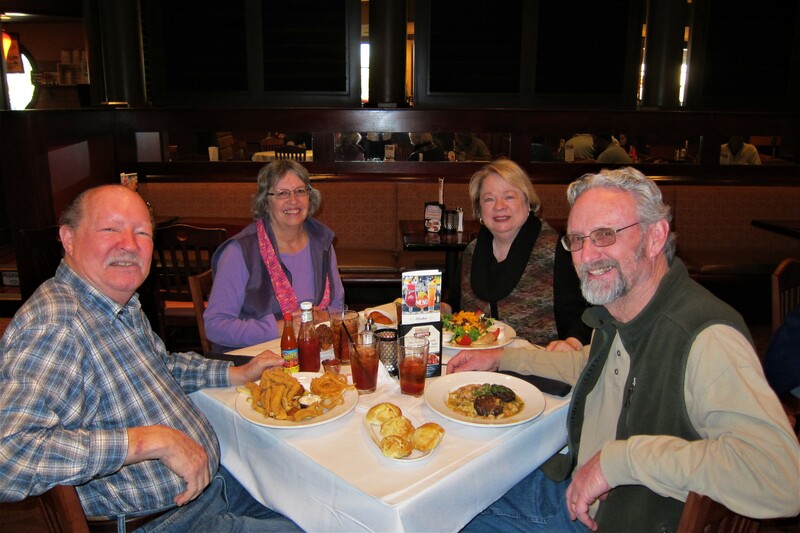 Glad you were able to get together with our old friends, Ray & Darlene. Catching up on your annual trip. I knew you left but did not know what day. I will catch up tomorrow some time. Kathy and I are still in Maine and leaving 11 Feb. We will take the same route as you but we stop and camp on the way down and back, There is a nice campground open year round in Pine Grove, Pa 512 miles from home so it makes for a long first day. From Pine Grove we are stopping at a friends for a few days in Raleigh, NC and from there we are going for 5 days at Kings Bay, Two weeks in Mayport and 12 days at Ft Myers, FL where we will se a few Red Sox spring training games. Then off to Milton, FL where our daughter lives. We went to Fort Barrancas last year and the Air museum too. We will stay there until we head home around the first part of May. We take the same route back as you came down. Have a safe trip. Hi Kip, great to hear from you! Hope you have a safe and smooth trip south and an enjoyable time in Florida. Thanks for the tip on the open campground in Pine Grove, PA…we’ll check it out! 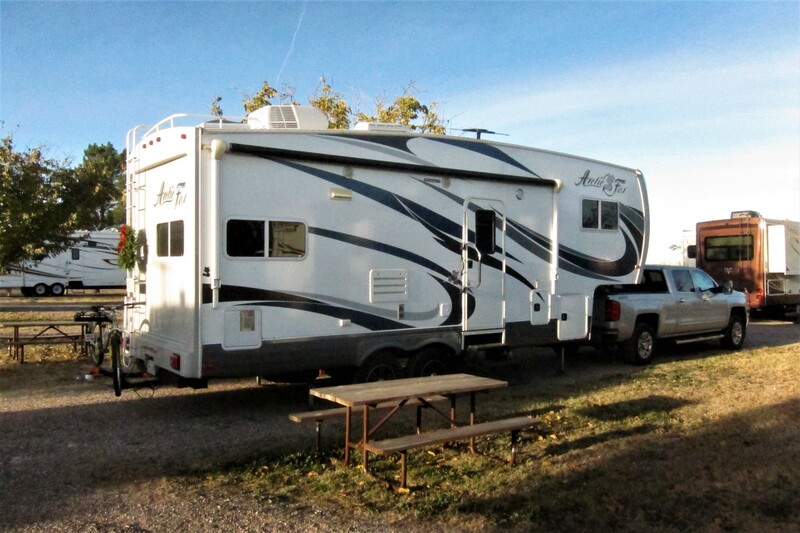 Keep in touch, you never know when our RV paths may cross, it would be great to camp with you folks for a few days! Thanks Bill. Enjoy your blog and just caught up on the journey last night. I have been busy getting ready to leave tomorrow and the weather is not cooperating. It has snowed twice the last two days and looks like we will be driving in snow in the morning. Aside from the snow the temps are near 0 in the morning. Sunday night into Monday they are calling for a foot plus. Why are we still here? Should have been south sooner. Oh well, live and learn. Have a safe journey too and I will be checking in to see where your at.